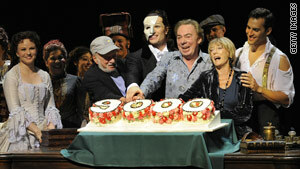 In September, Lloyd Webber celebrated the 9,000th performance of "The Phantom of the Opera." (CNN) -- Andrew Lloyd Webber, the award-winning composer and producer of more than a dozen musicals including "The Phantom of the Opera" and "Cats," has been diagnosed with prostate cancer, a spokeswoman said Sunday. "The condition is in its very early stages. Andrew is now undergoing treatment and expects to be fully back at work before the end of the year," the spokeswoman said in a written statement from the London-based public relations firm Brown Lloyd James. They released no further details. In April, the Sunday Times of London included Lloyd Webber, 61, on its annual Rich list, which ranks the wealthiest people in Britain. Lloyd Webber, who lives in Kensington, was the highest-ranking entertainer on the list. He tied for 52nd place, with about $1.1 billion.